It looks like our crew is foregoing college in order to start solving crimes right away. So, I expect a lot of sleuthing this episode, that is if Lee Ahn can pass his exam. Though I do have a feeling that he will sleuth with or without a badge. Recap starts at 9:30am CST! Jaein and her father are sitting together at work, he tells her that he will spread around the flyers. She smiles and continues working on her drawing as he leaves. That is when the ladies of the apartment complex give him a hard time about spreading these flyers that ask to have better fire lanes observance. The ladies don’t like it. He tells them that he knows they get secret money from the HOA, but she should not do this because this is related to our safety. Of course the lady goes off on him. She tells him that he is crazy and she recommended him because he is an ex fireman. She looks at his kid in his tiny office and says that he can’t bring his kid here. The father says that it is almost time to come home so his kid just came by. But the women do not care and the leader says that he is fired right now. She throws his things on the ground. Jaeim helpd him pick it up and tells her appa not to worry, you are doing your job, that ajumma is just crazy. Appa wonders what they shuold do. Jaein says theyc an find another job. But appa says he is more concerned about fires, if they have one then this apartment complex with have problems. he fixes his daughters jaket and then heads inside to pass out the flyers. Inside, there is a flyer looking fo a person. It is a pencil drawing of a woman. There is also a suspicious man that walks in with a sinister smile. The microwave explodes and the ire breaks out. Jaeim hears the commotion and goes otuside to see a lot of people pointing at the fire. She sees her appa. Appa yells to her and tells her that he will be there soon, don’t worry. She nods. Lee Ahn is trying to cheat on the test when Jaein tells him to stop. He immediately stretches. She tells him that doing anything other than solving the problem with his own brain is illegal, if we catch you then you are out. Lee Ahn feels something and looks up, it is Jaein. he stands up and says that he found her! Yoon Jaein. Jaein keeps looking at her like a toughened police officer. Later on, Jaein tells everyone to stop working ont he exam. Lee Ahn looks at her with doey eyes and walks up to her, she simply tells him that she will talk to him outside. She isn’t running away. Elsewhere, Jisoo meets with Autopsy doctor Soohyeon over tea in a pretty cafe. They both are dressed relaxed. Soohyun asks Jisoo if she is still not giving up on this case? Cut to Sungmo and Jisoo talking to Superintendent Byungho in a flashback. They tried to tell him that they cannot give up on this case here, the only witness is dead. But her father says that she needs to think about him and his reputation as well. Sungmo tells him that he knows that they already have had their press conference. But he starts to turn the conversation to the apartment fire case when he was a child. He says that he remembers that the apartment fire case was closed very quickly like this nursing home case. Appa says that he did everything by the book. Either bring me the evidence or the real murderer. I heard the prosecutor also does not want to do this, so it does not matter that you ask me like this. Sungmo says that he will take it that he should investigate unofficially. In the cafe, Jisoo tells Sooyeon that his mother did not die in the fire in the apartment, she was one of the people who was stabbed. that is why he is so obsessed with this case. Sooyeon says that sungmo does not have affection to anyone but that psycho guy. Jisoo tells her he is not psycho! 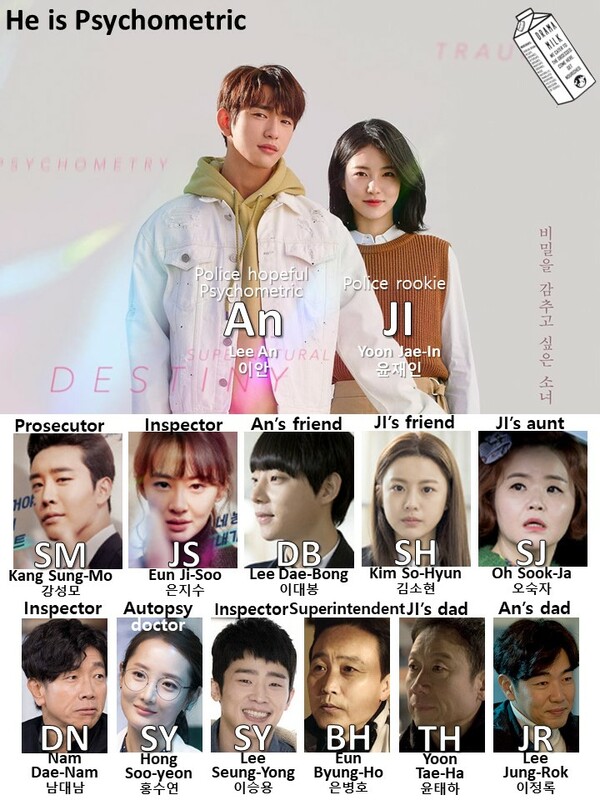 he is Psychometric! Sooyeon is all like, okay, okay, anyway the autopsy person said that if their hunch is true then the murderer is not a regular murderer because he did not leave any evidence behind. Sungmo is in his office thinking about the insurance workers interview and how he was murdered when he was on his way to see them. He also thinks back to the fire and Jaein’s father helping Lee Ahn. He wonders about the chain as well. So, he closes his eyes and thinks. In the police station, Lee Ahn says that he is suprised to see her again, how have you been. He extends his hand to shake. But he is only practicing wiith his car as a standin and nervously thinks that she won’t shake his hand. Then she comes outside. They both look at each other. She smiles and slowly walks to him. VO – I need anything to protect me. I don’t have parents or a background. I survive as a title as #1 at school. But if people know that I am a super poor person living in an octapang then I have no defense. I won’t be able to stand it. He remembers the events of the last episode that led her to run away all while she is walking towards him. In his memory he told her that he will help her when she is ready. She left one last message on her door so he could psychometric it by chance and told him that what he said comforted her. She wants him to develop his ability, when she is confident, she will find him. Cut to them both walking along a city park. She tells him that he tried to copy the person in front of him, right! Hey, those people studied a lot in a tiny goshiwon with no windows. Dont’ copy those peoples effort. He tells her that is all she has to say after meeting for two years? Also, you said that you would go to Seoul University but you are a policeman now? She tells him that she could not take the college exam because she was busy running away, so she just took the high school exam and the police exam. She asks him if he is helping his hyung and noona with his ability? Are you consulting? He smiles and says he is a psychometrist. She is pretty amazed, you are a real psychometrist? He smiles, of course. Cut to him psychometrying a body, but he gets it all wrong. Jisoo kicks him in the shin and Sungmo claps. Later Jisoo tells him to find the license plate number for a hit and run He tries to psychometry this new person. He saw a number! He thinks it should be the right on. He says the number. But Sooyeon throws a bag at him, it is 1946 which is on the shirt of the victim. They bet whether Lee Ahn could do it so Sooyeon won. Sungmo and Jisoo had to give her money. She tells them that if they bring him there one more time they will be the ones laying there. In the present, Lee Ahn tries to say that he is great and his hyung and noona can’t hide his ability anymore, they want him to be a policeman soon. He asks her if she works there, she says no, in another district. She is not in the violence team yet, she is still a trainee. But she thinks she will be on the violence team. He agrees and says that she has always been smart. They walk back to his car. He says he can drop her off in her district, but she says she has an appointment. He wonders if he should bring up that he read the door handle and heard her message. But he doesn’t, he just tells her that he still lives on that same octapang. They part. But he knows that she is in So-eun district. He is happy with that. Elsewhere, Sungmo meets one of the ex high school teachers at a butcher shop, it looks like he is a butcher now. This is the chubby teacher that tried to protect the kids. The teacher asks how Sungmo made Ahn so civilized, he always tried to destroy whoever touched him, but you helped him graduate. Sungmo tells him that he doesn’t have a job yet, though. He smiles and takes his food then is picked up by Lee Ahn. They drive off cheerfully together. Sungmo asks him how the exam went. Lee Ahn is happy about it but wonders if he even put his name on it? Sungmo thinks that might be good, he won’t have to turn him in as a cheater. They playfully banter back and forth about who saved whose life before and becoming a police officer and Ahns ability that he has to use for the good of all, though this ability is not useful yet. Also, how can you buy chiken but no beer? They end up driving to a spot thta is not their home. Lee Ahn asks where they are and whya re they there? Sungmo says he got them a new place. Ahn is immediately frantic about telling Jaein that they stayed in the same place as before. But he has to go in now because Jisoo is waiting for them with food of her own. They all go inside this fancy looking and yet simplistic apartment. It is much better than their old place. They all joke about how this place fits the life of a prosecutor much better. Jisoo bought beer so Ahn says that they mathc because she bought the beer and Sungmo bought the chicken. Ahn asks why she is all dressed up? She says that her father wanted her to have a blind date. They all start to eat the fried chicken. Lee Ahn also tells them that Jaein became a police officer, he saw her today at the exam. Jisoo thinks that she disappeared right before the exam. Well, a lot of kids prepare to become government workers instead of going to college, unlike another student. She says it a bit sarcastically and looks at Lee Ahn. Later on, Sungmo takes a shower and thinks about the Priest telling him that he cannot contact Jaein anymore. So he can’t give her anymore money, sorry. Perhaps she needs more time. In the living room, Lee Ahn talks about Jaein and how she was so cool. Jisoo says that first love is like that. When you think about it you just want to burp. He asks why she is so centimeter. She says it is sen-ti-men-tal, sentimental. He asks what’s up with her, if you don’t tell me then I will find out. he pretends to touch her, she hits his hands with chicken. He tells her that she is just like Daebong, she is so easy to read because she doesn’t think. She decides to tell him because it is more embarrassing to get caught. She leans in and tells him that she confessed to “him” but got dumped. Lee Ahn is all like, again!!!! Flashback to Jisoo cutely talking to Sungmo when they were young professionals. She tries to tell him that she likes him but he interrupts and says that he was rude not keeping things professional, he then switches to Jongdaemal, bows, and walks away. Lee Ahn tells he that he only saw that one scene. But it is obvious that you like him. You follow him around and always ask him to eat and all that. Jisoo says that he wondered about his exam and they moved. But Ahn smiles and just tells her that he is her excuuuuuuuse. Do you really worry about me? Can you say that to the gods? She doesn’t answer. He mocks her a bit about it. Then says that it is so obvious. She wonders if it really is? he nods. She is bummed and thinks that she will leave. But Ahn says that she should get embarrassed a lot so she can get used to it. She pretends to punch him and walks off, he giggles then asks his doggie if he wants to share his chicken with him. Lee Ahn goes to the mustang happily and gets in. But he also thinks that he should tell Jaein where he lives now. That is the only reason that he is going to find her. he drives off. Daebong calls and tells him that he wants his car back. Ahn tells him that he will only have it one more day. Daebong is all like, fine fine fine, lets hang up. Ahn yells, I love you! Daebong starts to help one of the customers and it turns out to be his long lost love, Sohyun. She asks him if this is also his gas station? He nods and says it is. But he is so stunned and stutters a lot as he asks if she can open her gas tank. He also tells her that she does not have to pay. You are not the only one! I give free gas to all my friends from school. She tells him not to do that, this is why I don’t use your gas stations. Can I pay for it? She hands over a card. He takes it and runs the bill, but he also gives her a lot of water and drinks. Though he makes sure he tells her that he does this for all his first customers. he also gives her a lot of free coupons. Her baby is in the back and looks oh so cute. Daebong watches her driving away with his puppy dog eyes. Meanwhile, Ahn goes to Jaein’s workplace only they tell him that she does not work there. But one of them knows that she is actually a trainee in another center. Ahn runs out and asks Jisoo noona about the center. Jisoo knows about it but thought that this center was no longer operating. Cut to the center, the aunt is there singing happily for elderly people When Jaein peeks her head in. Jisoo explains that this probably means that Jaein lives at that station which is more like a cultural center that takes care of very tiny neighborhood things. Jaein gets ready in the center and drives off to do her neighborhood eunnie job. A little girl tells her that she found a coin in front of a store and asks if she can find the owner. Jain smiles and gives her a candy. The kid does not looks satisfied. Cut to Jaein printing out a good citizen award for the little girl. Now she is happy. There is also an elderly woman who needs directions so Jaein helps her. There is also a mom who smiles and gives Jaein a signal so Jaein tells this little girl that she should not lie. Jisoo tells Ahn that a lot of people don’t live in the neighborhood, it is actually a nice place to work. Not much happens, just little neighborly things. The only problem is that you will not get promoted. Cut back to Jaein in her neighborhood, this time she is sitting to eat cup ddukbogi. Lee Ahn walks up to her in the midst of that. They end up going inside her office (it looks like this is a one woman operation). She tells him that sh did not lie to him, she will move to the violence team. He tells her that his noona told him that this is a station for soon to be retired policeofficers. Why would a new trainee come here. She says that her mentor moved there. She asked him if he knew of a good place to stay so he said that she could stay there. She actually got found out when she was looking at old case files. She does not want to be fired and is old enough not to run away and has a little reputation so I had to work here to maintain my job. Ahn asks if she saw her fathers case? Jaein says no, never ever because if I see the data then everyone can track it because it is computerized. My boss wants to retire so he told me to become a real policeman and find it by myself, that is when he brought me here. Perhaps I shouldnt’ have done it. Ahn asks if she can go to the violence team here? He heard it would be difficult. She is pretty impressed that he knows stuff. he says he has to know something to become a police officer. She chides him about not being a police officer and his hyung still not wanting him to be involved in investigations? Ahn is all like…well, maybe so. But then a woman comes in frantically yelling about her daughter that disappeared. She yelled at her so she ran away. Jaein and Ahn head out to find her. Jaein says that this happens all the time, she is actually on their black list. But Ahn thinks that they have to call it in, what if she was adbucted or something! The mother hears this and grows even more nervous. Jaein tells him not to think about those things and cause people to worry. They start to run off to search for the girl and asks everyone around the neighborhood if they have seen a little girl walking around. They walk around for over one hour. Jaein thinks she is hiding somewhere. Kids sometimes do that. But then she notices something in the creek, it is Jooah’s teddy bear. They run to the stream and walk over the rocks to get it. Ahn psychometries the beer and sees that the girl has actually been abducted and possibly put in a bag. He tell sher that he thinks she was kidnapped, he saw it with psychometry. She is in a black carrier. But actually Inspector Daenam calls from the bridge and asks why they are there. The girl is with him and is actually standing next to her grandmother and mother. Jaein sighs. Ahn asks if that is the girl? Jaein asks if he really saw someone in a case. The girl yells that that is her stuffed animal. Ahn picks up the stuffed animal again and says that it really did happen. This time he sees the luggage with hair sticking out of it on the creek. Cut to a ton of policeman excavating the area. Sungmo and Jisoo are there at the creek as well. Lee Ahn is so happy that he found this bag, he can’t stop smiling. Though he toughens up when he talks to Jisoo about it and says that he is the one that found this suitcase. he is so proud of himself. They walk into Jaein who is still there standing on alert. Jisoo tells her that it is good to see her again. Jain salutes Jisoo and wonders if she also knows something. Jaein starts to recount what she thinks might have happened. The carrier might have been carried from the Han river one month ago becaue of all the rain And it could be possible that it is on the surface because there has not been a lot of rain since. We see a little animation of this while she is talking. Jaein continues to explain why she thinks this suitcase came from the Han river. Ahn thinks that is nonsense, how can a suitcase with a body float all the way from the Han river to here. Jaein explains that decomposing bodies create great boyancy due to gasses. They can carry even 70kg of weight below them. Jisoo asks if she is the one keeping the police line? That is good, stop Ahn from coming in because he did not understand anything you just said. Ahn tries to say that he diiiiiiid, I know decomposing gaaaaaaaas. Jisoo just pats him on the back. Elsewhere, Sohyun talks to Inspector Daenam about the body that was found, she is a bit shocked. Nam says that he took this job because nothing is suposed to happen here. He sighs. Sohyun tells him that she brought the kids from daycase there because Jain will give them a class on getting lost. Nam complains about Jaein creating a lot of work. Sohyuna asks if she should cancel it? he says no, she can have it. He starts to try and gather the kids up, but they don’t listen. Sohyun sings to the kids and they all come to her. But Sohyun also wonders why there is a case like this in this neighborhood, so strange. In the autopsy room, Sooyeon complains about bodies in suitcases in water. Jisoo says she complaied about bodies in sewers before. Sooyeon keeps complaining about spending half a life doing this job, it is a curse! Jisoo tells her that she is must be a coconspirator from her past life since she has to help her. 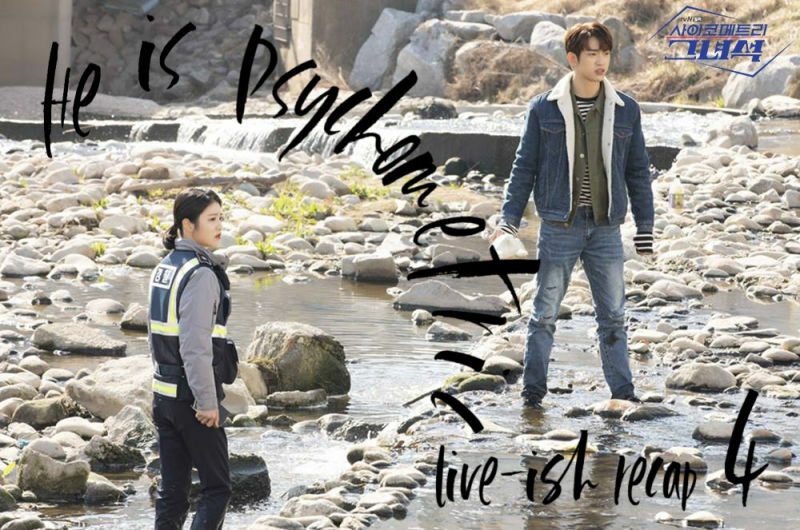 Meanwhile, Lee Ahn tries to psychometry everything at the site. But he just feels poop with everything he touches. Jaein tells him not to waste his time because the criminal was nowhere near there. He sits with her and they chat about how today is the best chance for him to show himself. Jaein says that it is also a good day because she showed her ability to inspector Eun Ji-soo. Even though she is only guarding the police line, this is the most she has done. Usually she is so bored that she goes home. They start to talk about psychometry things and how he actually did see a suitcase with a body! Who said that he didn’t! He teases her about this. He also asks her about the boyancy and how she knows about luggage that can be carried by the river? Jisoo starts to do a presentation with all the detectives about the woman in the luggage. They think this woman was in her 50s. It should have been winter when she died. She also had cement in the luggage, same as the last case. In this case the body did not decompose, it mummified. If they do not find the murderer, like last time, then this is not good. Last time the victim did not have family members so they did not know when she died. Her appa asks if this is why she thinks they can’t find the criminal? Sungmo starts to say that one dead body and two dead bodies are different. Appa tells them that he trust them to solve this as soon as possible. This case has been on the online portal for too long (because there are no entertainment scandals) so do a good job. He points at his daughter to do a good job and kind of like, “I am your boss”. She salutes him. After the meeting, someone asks why her dad is so angry. Is it because you are not married? I thought he was super profesional during investigations but….~. Jisoo tells him thta it is whatever, it is just old man history. He just gives me stress and a blind date every weekend. But now his plan has changed. Sungmo tells them that Byungho is actually a success story who went from a normal policeman to a superintendent. Okay, see you later. He hops in his office (or the elevator?). Jisoo and this other detective talk about why Sungmo ended this conversation with her father? No one else noticed this but I noticed it. Wow, he is so skilled. The other guy wonders what this means. Jisoo looks at him and wonders how this guy can investigate things, tsk tsk tsk. Meanwhile, Sungmo looks at all the cases and takes a lot of pills as he thinks. then he starts working again. Jisoo sends him a text. JS: For your information “he” found the dead body. If he knows that you are the prosecutor for the case then he will bug you a lot, you should be ready. In the autopsy room, Jisoo tells Sooyeon that she told him as officially as possible. No emotions at all – good. Good job. Yes, you just need to be like this. Sooyeon tells her that this is how she should be. Back at the crime scene, Ahn is still standing with Jaein as she holds the police line. He checks his phone about the case. She tells him that she is going back to the station now and asks him if he is coming? In the prosecutors office, Sungmo starts to head down the steps when he looks out the window and sees a man standing in front of a car in all black. He starts to think back to slices of things that he saw as a child with metal foot bindings and being in a room that looks like a bathroom. He also remembers a man dragging a suitcase into the apartment. He runs out tot he car, but this person is not there. Sungmo starts to drive home. Jisoo sends him another message. JS: he found it with his high school friend that became a police officer. They should be very excited so you should be super duper ready. Cut to Ahn walking back with Jaein. He thinks something is strange, perhaps he can psychometry her better than others. She thinks that might be strange. he mentions the teachers room and also says that she studied a lot. Jaein mentions that she really hated the police because of what happened to her father. She also asks him about his noona. She came to see me as soon as the math teacher was released. She was angry as if it was her own [story]. Ahn says that all police are not the same. Jaein says that when she became a police officer, the suspect always says that they did not do it. I can check it over many many times. I decided to not make people like my father or myself. Even if I cannot prove his innocence, it is still worth doing this. SM – Finally, you are starting to think about your life regardless of your father. They both look up and see Sungmo there. Ahn asks why hyung is there. Jaein smiles and calls him her helper ajusshi. Ahn is all like, what did you just say? In the background, a man in all black, a black hat, and a black mask watches them. I cannot emphasize enough how much I enjoy that this writer is not going for a tear jerker drama! We already have enough emotion inherent with these crime scenes and our main characters back stories. We don’t need to pile on any more with victims families and friends from each case crying buckets of tears as they are dragged away from bodies and then sent into a flashback about how amazing a person the victim was and ow many people loved them. That is usually what Kdramas do which is why I avoid these types of shows. But this one is not and I love it! JI – Live forever blaming my father? JS – You know that if we don’t find the murderer it will be an unsolved case forever. Ahn – Hey, wake up. You are doing things this way, that is why other guys look down on us. Ji – Can you give me time to think? SM – Who is that person? SY – Don’t you remember? Kang Hee-soo. Ahn – Who are you!